Whitby Town boss Darren Williams praised centre half Richard Pell, who won the accolade “all the players want” at the club’s end of season presentation. Keeper Shane Bland scooped a double with the supporters’ and website player of the season awards while midfielder Dave McTiernan shone as top scorer. 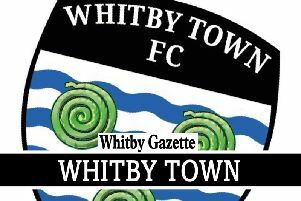 But Williams told the Whitby Gazette the player’s award, won this season by defender Richard Pell, was the one everyone wanted. “To get the players’ vote is probably the one that you want as that’s your team-mates appreciating what you have done over the season,” he said. “Richard does what it says on the tin – great defending, and he is a great lad to have about. He leads by example, puts himself about and gets stuck in. Bland’s decision not to go ahead with a move to the USA last summer, allowing him to return to Whitby, proved a good one for the club as his brace of awards proved. “He saved me a massive headache last year when he decided to stay,” said Williams. “He has come on leaps and bounds. He has kept us in games when probably we shouldn’t have been in them. Midfielder Dave McTiernan “came out of blocks quickly” to finish as the Blues’ top-scorer with 11 goals. He never looked back after scoring four times in September and followed that up with a crucial double to help his side to a 3-1 home win over Nantwich. Williams said the player, known as Macca, said he had a passion for the game and sometimes got frustrated if the team wasn’t playing well, but had made a huge impact with this finishing all season. The presentation took place at The Stables. Top goalscorer: 1 Dave McTiernan, 2 Steven Snaith, 3 Dale Hopson. Geoff Swales WTFC forum player of the year: 1 Shane Bland, 2 Dave McTiernan, 3 Ibby Hassan, Dale Hopson, Liam Shepherd. Players’ player of the year: 1 Richard Pell, 2 Dave McTiernan, Dale Hopson, Lee Mason. Supporters’ Player of the Year: 1 Shane Bland, 2 Ibby Hassan, 3 Dave McTiernan.